If you’ve been on social media in the last year, you’ve probably encountered enticing, single-serving, microwave recipes for brownies, cakes and other desserts. They usually look amazing and always promise to be fast and easy. I went to baking school, but I still became temporarily obsessed with the idea of making my favorite desserts in minutes in the microwave. 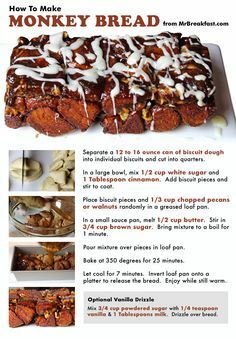 I tried several of the recipes and they we’re mostly satisfactory, if not stellar. 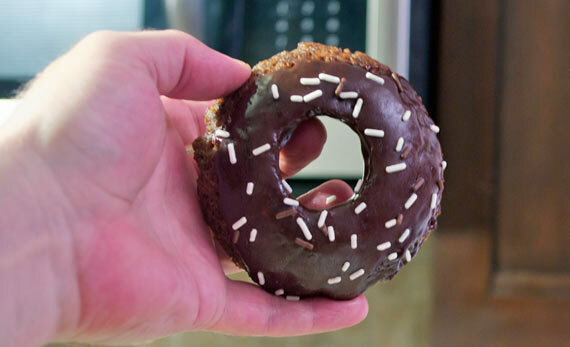 Throughout this quick-fix phase, I pondered how I could make a satisfying donut in the microwave. 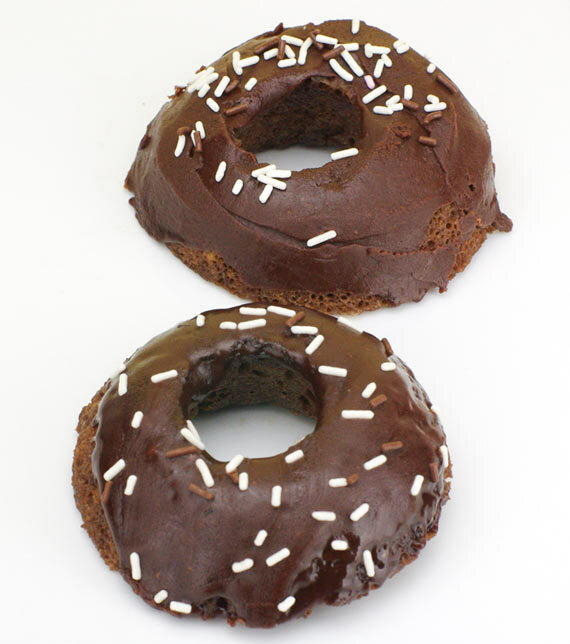 I tweaked and tested recipes until I came up with a microwave cake that tasted similar to a chocolate cake donut. Coming up with the recipe was the easy part. Making a donut out of it was another matter. I played with thicker batters piped in the shape of donuts. That didn’t work. The batter fused together in what was supposed to be the hole. Plus, the cake was too dry from having to add extra flour. I knew I had to find a way to stick to the recipe I liked, yet still create a donut shape. Having no luck, I decided to drink my troubles away. I was pouring bourbon into a shot glass to make a Manhattan. The answer was in my hand. I took the shot glass and rested it in a glass cereal bowl. There it was… a donut mold. I whipped up another batch of the cake batter, greased my makeshift mold and gave it a try. It worked! I realized on subsequent attempts that works best if the shot glass is right-side-up in the bowl with the smallest part of the glass touching the bowl. In a reality, these donuts are just cakes in funny shapes. But isn’t that what donuts are? They need icing to make them really feel like donuts. Without icing, they look kind of like sad, little, porous Bundt cakes. But once you add icing, you get the donut experience. 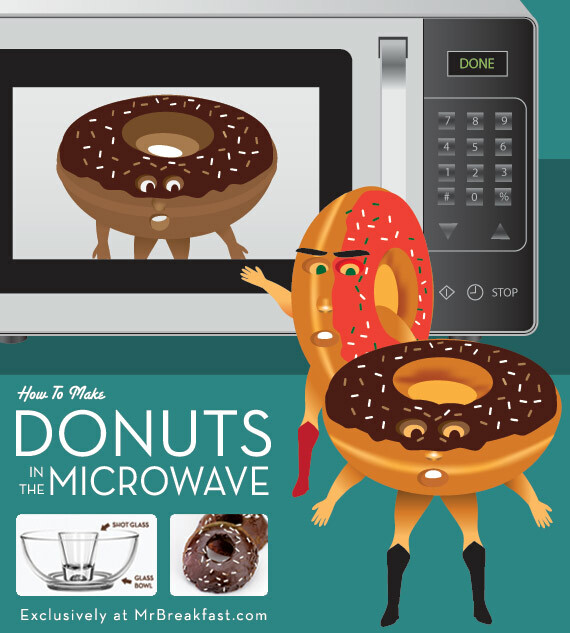 At least, you get the best donut experience you can get in a couple of minutes from your microwave. They’re not quite as good as a real donut. But I would suggest that nothing is quite as good as real donut… except maybe bacon. 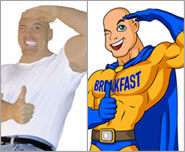 But for a quick fix, these are terrific. Everything you need to know is on the recipe card above, but I’ll go into detail below in case you want further explanation on those purposefully simplistic instructions. 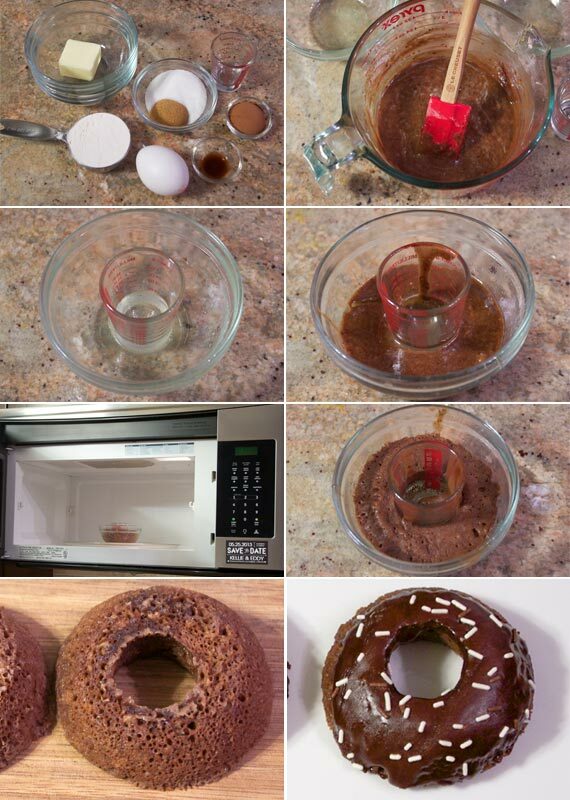 This recipe makes 2 microwave donuts. 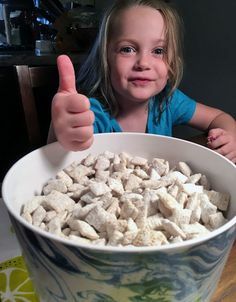 You will need a microwave-safe, small bowl with a rounded bottom (with about a 4 and 1/2 inch top diameter), a standard glass shot glass and a mixing bowl. In a medium mixing bowl (I like to use a big measuring cup with a pour spout), beat the egg. Add the sugars and vanilla and whisk to combine. Add the flour and cocoa powder and stir gently with a spatula until mostly moistened and combined. Pour in the melted butter and continue stirring until fully combined. Spray the inside of the small bowl with cooking spray (or see tip below about using butter). Spray the outside of the shot glass with cooking spray and place it right-side-up in the middle of the bowl. Pour half the batter in the bowl around the shot glass. Remove the shot glass. When the bowl is cool enough to handle, invert it to release the donut. Clean the bowl and shot glass. Re-spray with cooking spray and use remaining batter to make the second donut. 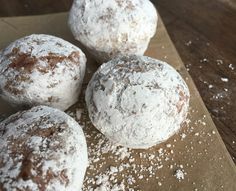 Sprinkle with powdered sugar or apply icing as desired. I like to melt the butter in the small bowl I use for the donuts and then swirl it around to grease the bowl instead of using cooking spray. When preparing the batter, allow melted butter to cool slightly so it’s not hot enough to cook the egg. In the picture above, you can see that the front donut was dipped in icing and the back donut had its icing applied with a spatula. The dipped donut looks more like a donut from a donut shop. Makes enough icing for 2 microwave donuts. Melt the butter in a microwave-safe bowl by microwaving for about 20 seconds (I wipe out my donut bowl and use that). Add all remaining ingredients and stir to combine. Microwave on high for 30 seconds (mixture will bubble). Stir and microwave 30 more seconds. 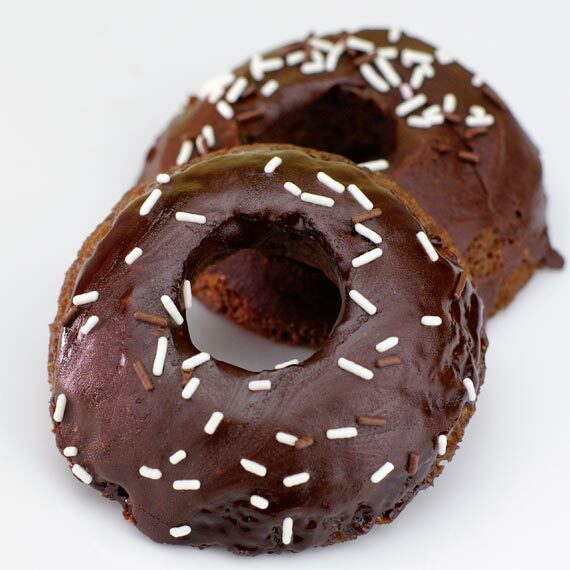 Stir and then ice the donuts either by dipping the donuts in the warm icing or by applying the icing with a spatula. Add any sprinkles or other decorations immediately after icing. I wouldn’t recommend using yeast. I haven’t tried it, but you might try replacing the brown sugar with an extra Tablespoon of white sugar, omitting the cocoa powder and increasing the vanilla to 1/2 teaspoon. I’d also add a pinch of cinnamon and a dash of nutmeg so they have a little more flavor to replace the cocoa. Please let me know if you try it. Thanks! Hey this is a great idea, and I especially like the cup-in-bowl trick. Came across your site while searching for a breakfast recipe using rice. Finding this one was a happy surprise. Just tried it and it came out surprisingly well! Fun and yummy. If you trim the edges to make them a little rounder where the batter meets the bowl, they look even more donutty. Could I make a, like, donut ‭stuffed with icing in the microwave? Or would it crust? If you want make 6 doughnuts instead of 2 in the microwave. Do you triple the ingredients, how long to cook it for and could I use plain flour instead of all purpose flour? Thank you.